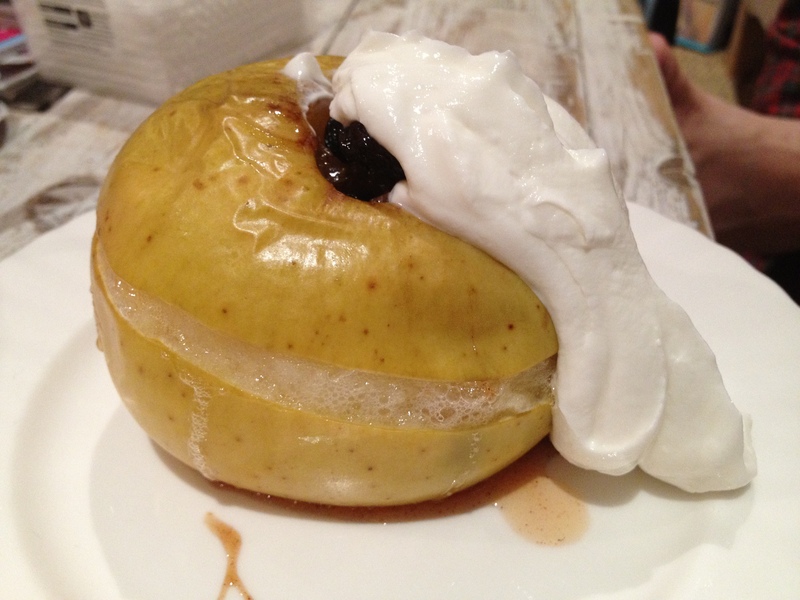 ~ I'm a pastry chef and blogger who loves to cook, eat and travel. follow my adventures through food with tips, tricks, recipes and reviews. 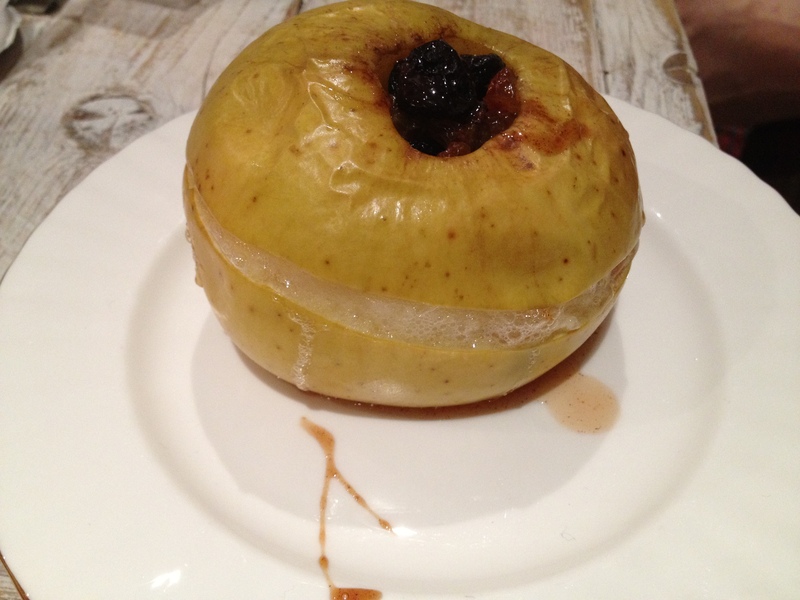 I think I’ll always love baked apples because they remind me of my childhood. My mum is a good cook but a self-confessed terrible baker and as a result, these were the only pudding i remember having with any frequency at home. Baking is a bit like Marmite i always think, you either love it, or you hate it. If you’re a little bit anally retentive (like me) chances are you’ll love it, all that weighing and measuring and the knowledge that if you stick to the plan, you’ll end up with something great every time is very reassuring. If, on the other hand you’re a little more slapdash in the kitchen (like both my mother and my boyfriend) then chances are you’ll hate it. They both find it far too rigid and precise and simply don’t have the patience. No matter which category you fall into however, you’ll love these. There’s something so comforting about their simplicity and the fact that they’re healthy is a huge bonus as most of the sweetness comes from the dried fruit. They’re also something you can so easily change according to your mood and what’s knocking around in the cupboard. Swap the raisins for dates, the sugar for honey, add some rosewater, some chopped almonds and if you’re feeling decadent, replace the yoghurt with cream – whatever takes your fancy. I would like to point out that the rum is my own addition, my brother and i weren’t routinely fed boozy apples in an attempt to shut us up in the evenings! If you’re making these for children then simply leave the rum out and add either a splash of fruit juice or water if the mixture looks too dry. 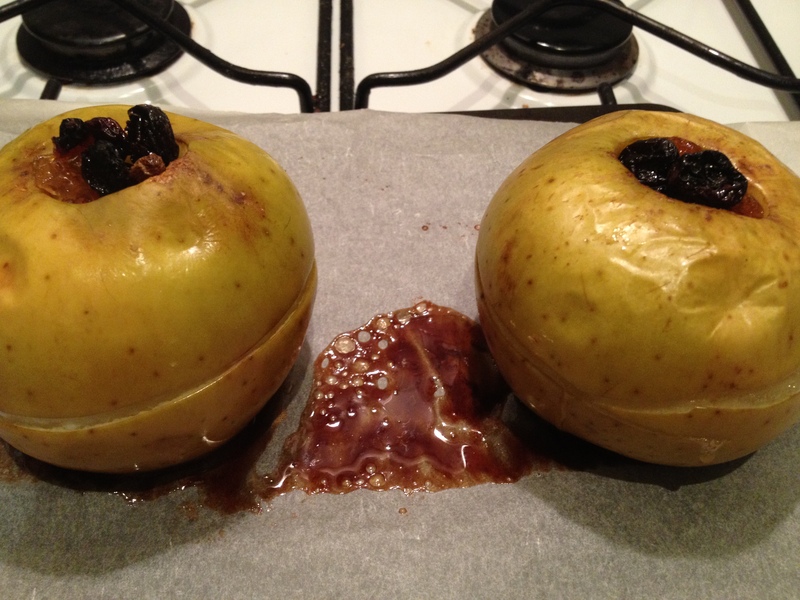 Pre-heat the oven to 170C, then core the apples but leave the skins on as they’re what hold the apples together whilst they cook. 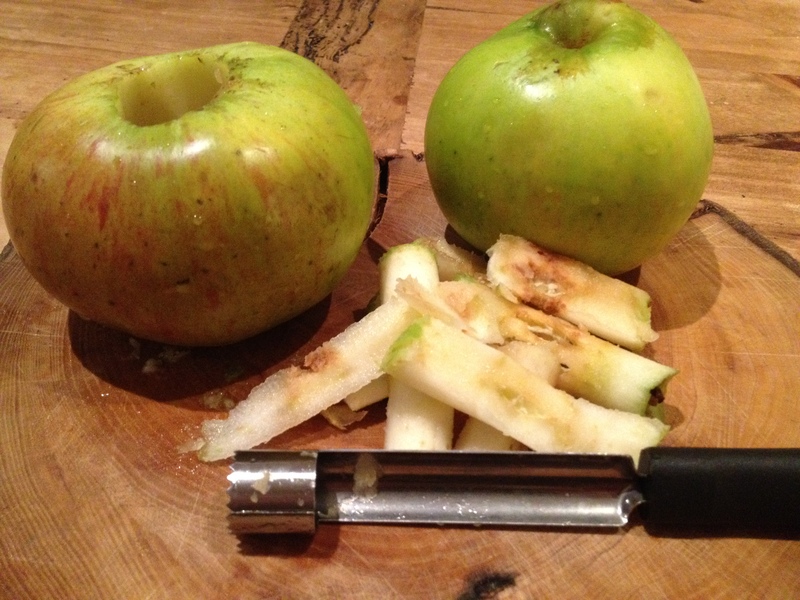 You may have to core the apples more than once as they’re so big, you probably won’t get it all in one go. Don’t worry if you think you’ve taken a bit much out, it just means you have a bigger space to fill with the raisin mix. 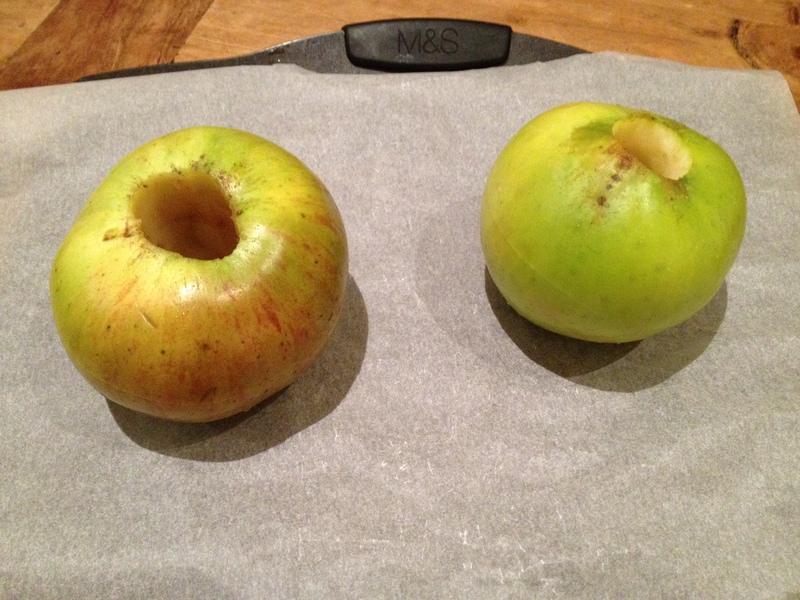 If you want to stop the apples from bursting out of their skins then score a line horizontally around the middle of the apple. If you forget, don’t worry, they’ll still be delicious and i have to admit to actually quite liking them when they’re a little wonky looking. 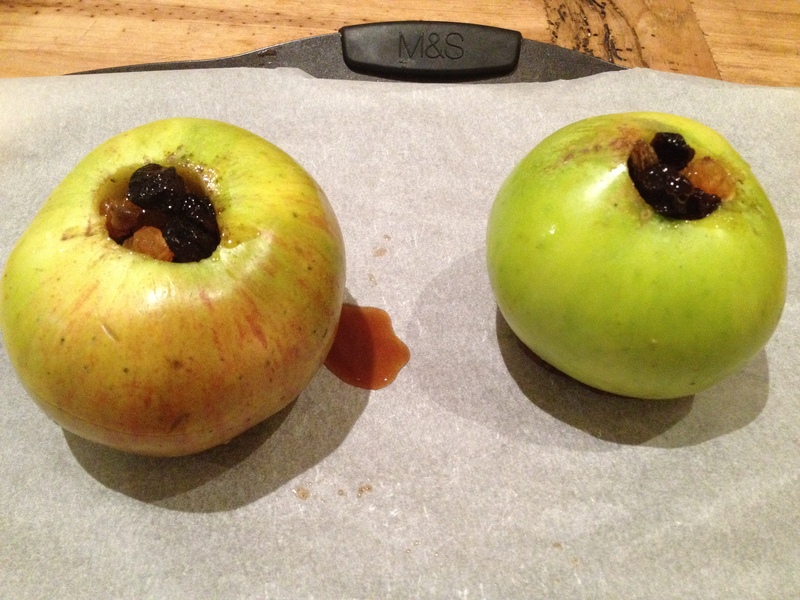 Place the apples onto a baking tray lined with baking paper, this is really just to stop them sticking. 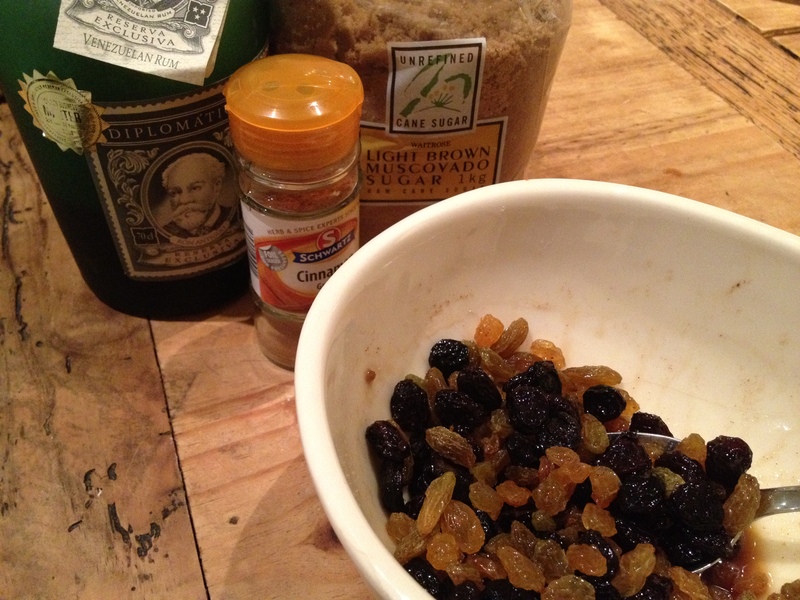 In a bowl, toss together the raisins, cinnamon, brown sugar and just enough rum to plump your raisins up a bit (or more if you want it!) and mix it all together so everything’s covered. Now all that’s left to do is fill the apples with the raisin filling, pack in as much as you can as this is where all the flavour is. Make sure you do this once the apples are already on the tray or they’ll be a pain to transfer over. Pop the apples into your preheated oven for about 20 minutes until the skins are shrinking and the apples are bubbling, you want them soft enough that you can eat them with a spoon. 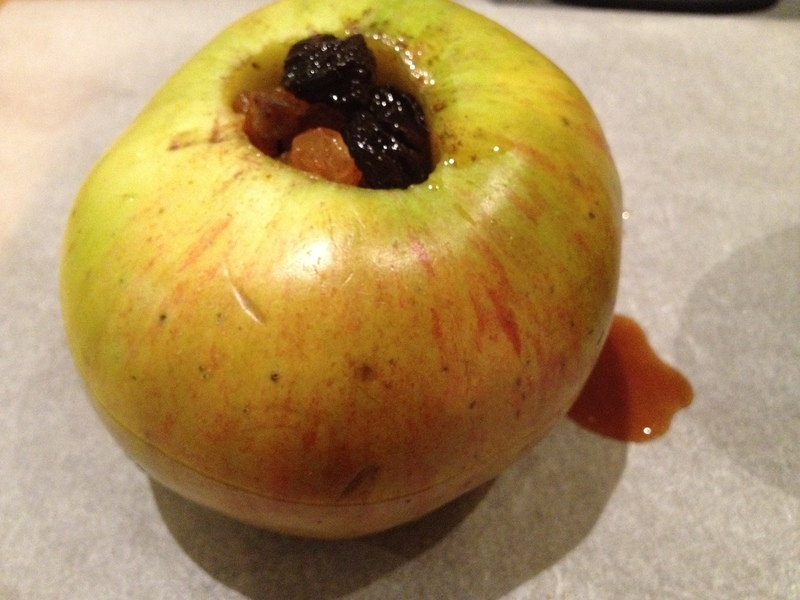 Using a fish slice, or something similar, transfer your apples to a plate, taking as much of the sticky sauce with you as you can. Top with greek yoghurt and a drizzle of honey if you fancy it, and eat while it’s still warm.